Largely self taught as an architect, he practiced variously in London, northern England, Edinburgh and Glasgow. The father of architectural illustrator Michael Angelo Nicholson (c. 1796-1844) and grandfather-in-law of Alexander 'Greek' Thomson , he was more widely known as an architectural historian and theorist than as a designer. 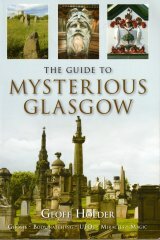 However, the influence of his many books and papers on Classical architecture exerted a profound influence on the development of the Neo-Classical style in Scotland, and in Glasgow in particular. Settling in Glasgow around 1800, he set up his paractice in premises at the corner of Argyle Street and Jamaica Street, and established himself as the most important post-Adam classisict in the city before the emergence of David Hamilton , with his palace fronted terraces in Carlton Place (1802-18, completed by John Brash, altered 1857, 1893, 1908), Yorkhill House, Overtoun, (1806, dem. c. 1911, the former home of painter John Graham Gilbert), and the Doric, Hamilton Building, Old College (1811, completed by John Brash, dem. c. 1870). Although Yorkhill House was replaced by a hospital in 1911-14, and the Hamilton Building was demolished for a railway goods yard in the 19th Century, Carlton Place has recently been restored to something of its original glory. Although its centrepiece, Laurie House (nos. 51-2), has been virtually forgotten as the most splendid, intact Georgian house in the city (it was built for the immensly wealthy James Laurie the developer of Laurieston as Glasgow's first 'planned' suburb south of the Clyde, and richly decorated internally with sumptuous plasterwork and sculpture by Francisco Bernasconi ). His lesser known commissions were for two footbridges across the Clyde to Carlton Place (1803-5), and the town plan for Ardrossan (1806). Nicholson's influence was strongly felt by Glasgow's John Baird I, Alexander 'Greek' Thomson and his partner, John Baird II, all of whom benefitted from studying his buildings and copious writings, e.g. Architectural Dictionary, New Practical Builder and The Carpenters New Guide. Nicholson was also related to Thomson and John Baird II through their marriage to his granddaughters in a joint ceremony in 1847, although he never met them. Eventually relocating to premises at 64 Argyle Street, c. 1805, he left Glasgow, c. 1808, and settled in London where he concentrated in promoting his son's career and on his own writing projects.